Responding to a question raised by a journalist from the “Dawn” newspaper, a Pakitani Publication,” whether he still believes in astrology”, former President Mahinda Rajapaksa said, “Now, I don’t” and laughed out loud. “I have to ask you this, do you still believe in astrology?” “Now, I don’t,” he says and laughs out loud. The former President went on to say that Pakistan helped Sri Lanka in quelling the Tamil insurgency. “See, the US, Europe, the West, they are not our friends,”. Speaking about his defeat in the elections, he said, “The Muslims in the East and people in the North were misled, probably by international forces,” . Now he goes to the other extrem, believing and not believing both are extrems. Blind belief blind refusal both are harmful and one should know how/ when and for what to believe it, only then he can benefit from it. MR seems continue with his weaknesses. The astrological interpretations of planetary influences on Mahinda Rajapaksa on 8th January 2015 were, we believe, not viewed in proper context. We believe, the planetary influences pointed to something good happening on that day. The moment an astrologer says ‘something good will happen’, the person receiving the advice assumes that the “good” is something which he wants. That is incorrect. What a person wants is not always, what the person needs. 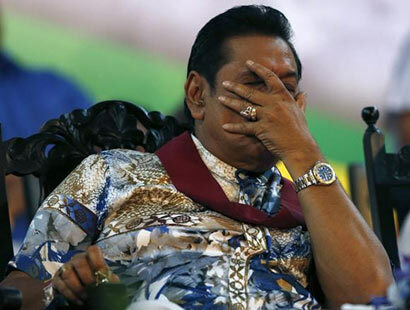 Mahinda Rajapaksa wanted to win the elections on 8th January. But that is not what he needed. In his latter years in office, Mahinda Rajapaksa was surrounded by a group of unscrupulous persons from within the family and outside. All most all leaders are subject to this phenomena. They are surrounded by a group and are driven by that group. Something good did happen to Mahinda Rajapaksa on 8th Jan. The group of unscrupulous persons who surrounded him for their own benefit, disintegrated; Mahinda Rajapaksa became a free man. In May 2009, Mahinda Rajapaksa redeemed our nation from the clutches of the terrorists. In Jan 2015, the skies redeemed Mahinda Rajapaksa from the clutches of evil groups who had surrounded him. Mahinda Rajapaksa is a true leader, the best the nation has had, since 1948. He is strong and decisive and at the same time, kind and considerate. His strengths far outweigh his weaknesses. History will recognise his contributions to this nation. Mahinda Rajapaksa never resorted to elimination as a means of dealing with competition and threat. One of his weaknesses is blind trust and confidence on people who were close to him, including siblings. Mahinda Rajapaksa belived that those surrounding him always do good things as he does. For example, Mahinda Rajapaksa was silent when a war-hero / political challenge was rough handled and imprisoned on flimsy grounds. Perhaps, Mahinda Rajapaksa was hurt by this incident and thus, true to his character, became withdrawn and silent. Mahinda Rajapaksa held a high office and is accountable for all things, good and bad, that occurred while in office. The bad things are now in the top of the agenda and accountability is likely to be enforced. But, Mahinda Rajapaksa’s stature and contributions to the welfare of our nation and its citizens, can never ever be diminished. Anyway, everything happening in the world remind us the ultimate reallty that nothing is permanent and world is ever changing. Nothing exists as it is forever.